Luxury holiday beach villa nestled in a private tropical flower and coconut tree garden of the Coconut Laguna Beachfront Resort, at only 40 meters from the beautiful Bang Por palm fringed and white sand beach, and at 20 meters from the crystal clear water swimming pool with basin for children and a whirlpool. Built to high western standards with a Thai design influence, this holiday villa is a spacious accommodation for 4 guests in two (2) spacious queen bedrooms each fitted with satellite 40” TV, DVD and en-suite bathrooms, a comfortable living room area with satellite 52” TV and surround sound system and a fully equipped western granite open plan kitchen. The huge covered outdoor living area is equipped with large table for 8, and sofas for eating 'al fresco' and relaxation. On the upper terrace, you can enjoy the jacuzzi for 2 person, sunbath and stunning sunset view. Fans and air-conditioners are in all indoor living area, free wireless internet access, free local telephone, international TV channels, 24hr/7d guarded resort, pool and garden daily maintenance, house cleaning common area every day, full house cleaning with linens and bath/beach towels replacement twice a week and kayaks are part of the facilities included for your comfort. Airport pick-up service, car or bike rental, additional maid service, cooking service, baby bed and chair, etc...can be arranged upon request by our local representative. At the Coconut Laguna holiday facility, there are altogether only 11 vacation villas. Two villas are built in the typical wooden Thai style, and the other villas are built of brick. A swimming pool graces the middle of the resort, surrounded by palm trees and ornamental shrubs, which brilliantly flower throughout the whole year. The swimming pool, with its crystal clear water, also features a separate pool for children and a whirlpool. The beach of Bang Por is 3.5 km long, luring visitors and holiday renters to take a stroll and explore the beach. 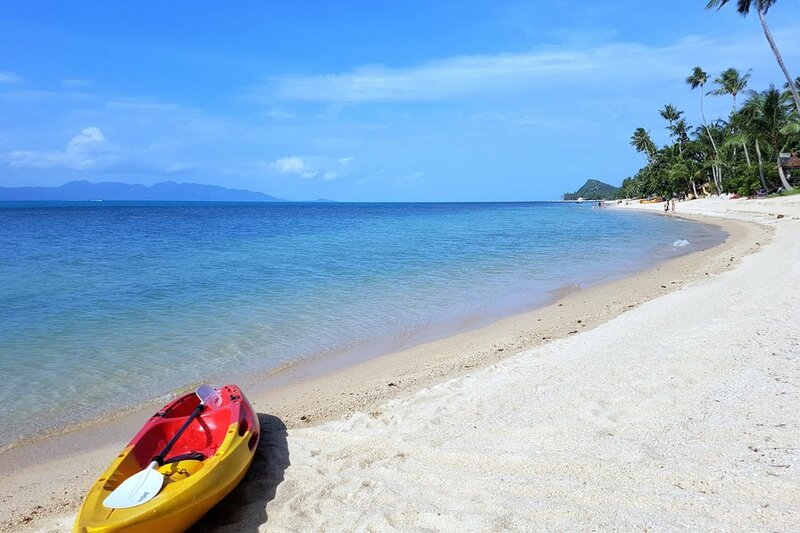 This sandy beach is unique on Koh Samui, and is also not crowded with many beachcombers and wandering tourists or beach-vendors. You will find, however, some of the island’s best Thai restaurants within walking distance.